We had a Sunday roast at Malmaison Brighton recently and enjoyed their Chef's Table as our starter. It's an epic array of yummy things you can visit as many times as you like! Nik found a voucher on Living Social which got us a discount but it's usually £19.95 for 2 courses (the chef's table and a main course) and dessert is an extra £3.50. 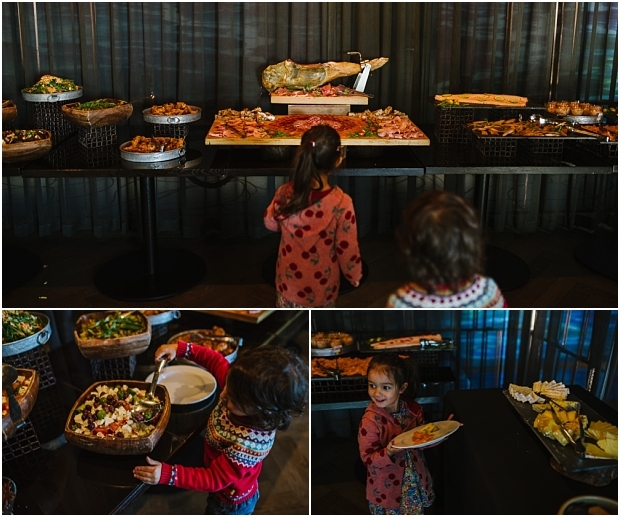 Kid's meals are £9.95 and also include the chef's table, much to Priya's delight as they had all her favourite things! The decor in Malmaison is lovely, funky yet classy with an old diving helmet on one wall adding to the coppery tones and various pretty lamps and nik-naks. Sorry to anyone who wanted olives in their Greek salad! K fished most of them out!! I had a lovely selection of fresh bread & butter, cold meats, salmon and salads! Priya with her 3 favourite foods - smoked salmon, salami and blue cheese! The roast was quite nice but I had to change my order. I usually love belly pork but when mine arrived, the three slices were about 80% fat! I know it's a fatty cut but the two slivers of meat within the fat were tiny, I just couldn't eat it. The staff were lovely about it though and swapped it for the beef for me with no issues. More fat than meat, I really couldn't eat this. The two generous slices of thick beef were moist and tender, served pink (as requested, they also had well done as an option) and with lovely roast potatoes and a big Yorkshire pud. Our veg included purple carrots and parsnips served whole and with extra gravy jugs. Nik wasn't keen on the gravy. It did have a sort of sticky texture and coated your mouth, perhaps due to the oil in it. Other than that we liked our meals but we'd probably choose something different as our main courses next time. The burgers we saw going past looked great! The kids behaved pretty well and ate most of their food so we all had pudding as a treat. 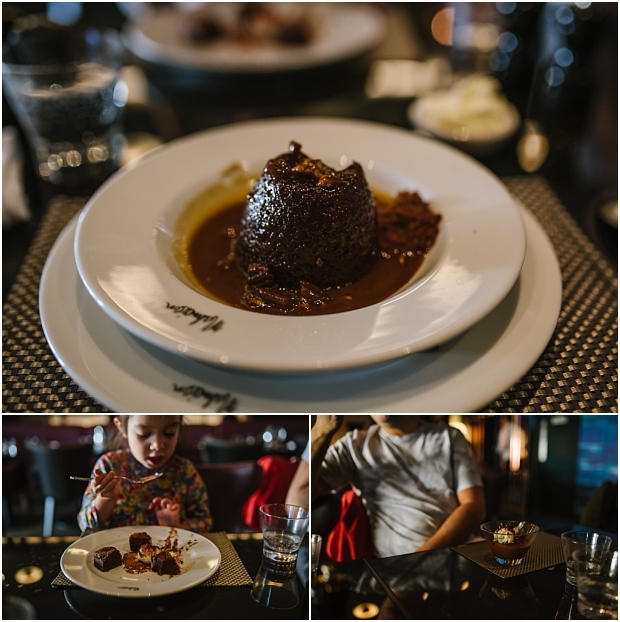 I went for the sticky toffee pud with pecan caramel sauce - SO GOOD! The crunchy pecans were perfect in the sauce and the sponge was light and tasty. Nik had the chocolate mousse which he said was his favourite thing followed by the chef's table. Kalyan had chocolate ice-cream and loved it and Priya's brownie and vanilla ice-cream were a hit too! Overall, we'd give it a good score despite being a bit disappointed by the roast. We'd go back just for the chef's table aspect - it's such great value if you're hungry and has some lovely options! The desserts were awesome too so just choose your main course wisely. The atmosphere was great, it got busier while we were there and as I said already, I liked the decor. Staff are very smartly dressed and friendly if a little busy at times (we never did get the ice we asked for).